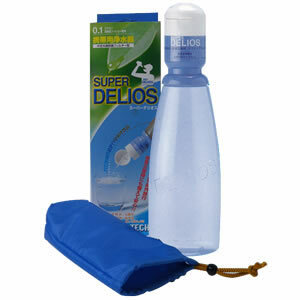 "SUPER DELIOS" is a portable water filter that can quickly produce safe and clean water by simply squeezing the container connected to the filter. Safe and clean water can be produced from various water sources; tap water, river water, well water, rain water and more. The filtered water is safe for consumption and a variety of other uses. One SUPER DELIOS unit can filter about 200 liters of water (depending on the source of water) in its lifetime. This translates to roughly 660 uses. The effective yet limited lifecycle makes the SUPER DELIOS ideal for occasional use or for post-disaster situations, but not for a long-term clean water source. The portable filter can be folded into the size of a fist for easy transport.